Please note: Pictured below are a few of the guitars that I’ve sold within the past few years. I just finished building this guitar using various new and used parts that I’ve accumulated over the years. This is not a restoration but is virtually like a new Emmons guitar! All aluminum brightwork, including the five knee lever handles were professionally polished, neck jeweled , etc. and the fret board is a new Emmons Factory replacement. The Gotoh keys are new and the legs are standard height. This guitar has a very standard Emmons set up; 3×5 with E’s on the left but I’ll be happy to switch it to Day style, (or your own copedent) at no extra charge (as long as no additional parts are required). The Emmons single coil pickup is wound to about 18K ohms. The guitar plays great, has that distinctive Emmons push-pull bell-like tone and wonderful sustain! Included is a nice leg/pedal rod bag and the original Wade Thomas hard case. $3300.00 plus shipping. PayPal (add 3%) or cashier’s check accepted. This is one of the last guitars that the late Jimmy Crawford and John Hughey produced and utilizes the latest changer design (featuring raise helper springs). The serial number is 9903. This is a very smooth playing all-pull guitar, very similar in looks to an early Emmons Lashley LeGrande with 4 hole rod pullers. It’s an original (except for the pickups) un-restored guitar in very nice 9/10 condition. These are very desirable guitars with excellent playability and awesome tone! This guitar has a triple raise, triple lower changer and split-tuning capability for every string. For example; using RKL (F#) and Pedal 2 (A) results with a tunable G note for the 6th string. I changed the strings, did a thorough detail, lube and a set-up, so it’s all dialed in and ready to gig! This guitar has a very standard Emmons set up; 8×5 with E’s on the left but I’ll be happy to switch it to Day style, (or your own copedent) at no extra charge (as long as no additional parts are required). The Emmons single coil pickups are wound to about 19K ohms. $4500.00 plus shipping. PayPal (add 3%) or cashier’s check accepted. I’ve just finished completely restoring this beautiful Sho~Bud, serial number is 11375. The cabinet was refinished in a semi-translucent black lacquer and the bright aluminum repolished, (end plates, necks, key heads, pedal rack channel, knee levers, pedals, etc.). Most of the work I did involved a complete disassembly of the guitar and a thorough cleaning of the entire under carriage. A few of the tops of the fingers had some string abrasion, so they were replaced. I also installed new nylon tuning nuts and a new neck selector switch. The Grover tuning machines are original and in very good condition and I chose to reinstall the original fret boards, also in nice condition. The guitar is presently at standard height with the original legs. At the moment, this guitar has a very standard Emmons set up; 8×4 with E’s on the left but I’ll be happy to switch it to Day style at no extra charge. I’ll also make reasonable changes to the existing copedent for free as long as you pay for any additional parts (if required). The guitar still has the original Sho~Bud single coil pickups that came with it. The E9 pickup is wound to about 19K ohms and the C6 about 21K ohms. They sound great with lots of presence and string separation. These vintage Sho~Bud guitars have a warm but clear tone and this one is no exception. Included is a new black Tolex split case set, with wheels on the main case for the guitar itself and a smaller one for the pedal rack, rods and legs and a new D2F leg bag. Note: I have purchased a very rare, Sho~Bud “clip-on” style volume pedal in nice condition that could go with this guitar. This is not a stand alone pedal, as it actually connects to the pedal rack. This can be purchased if desired, for an additional $150.00. $3200.00 plus shipping (volume pedal $150.00 additional). PayPal (add 3%) or cashier’s check accepted. This is a very nice guitar! S/N: 1084191 which indicates that it was originally built with 8 pedals and 4 knee levers in 1983. While talking with Bruce Zumsteg to order some parts, I was informed that this guitar was originally purchased by Chris “Tiny” Olson (who played for Gene Watson) and was actually used on several of his recordings! Chris bought the guitar “in person” and had Bruce add a 9th pedal and two additional knee levers; one for each neck. I just finished doing a complete rebuild, including teardown, thorough cleaning and professional polishing of all bright aluminum, with the exception of the sides of the necks. I chose to retain the original fret boards and as such, did not re-jewel the tops of the necks. I removed the 9th pedal but it could be reinstalled if required, for an additional $200.00 charge. The guitar also has been updated with split-tuning, so it’s up to modern standards. The original mica looks great for being about 30 years old. There are some scratches inside the key heads from changing strings and a couple of very minor ones elsewhere on the cabinet, too small to show up in the photos. 07/18/13 Update: Now that the rebuild has been completed, I’ve had an opportunity to play this guitar on the bandstand a few times. It plays great with very easy action, thanks to the raise helper springs and has wonderful tone, thanks to the specially designed changers with “constant body contact”. Bruce designed this feature in an attempt to emulate the famous Emmons push-pull tone. In my experience with owning ZumSteel guitars, I would have to say that this one does actually have some of that distinct tonal quality. Also, there is a lower return compensator unit, which can be used to gently bump any lowered strings that may tend to return slightly sharp. This guitar has a very standard Emmons set up; 8×6 with E’s on the left but I’ll be happy to switch it to Day style, (or your own copedent) at no extra charge (as long as no additional parts are required). The 5th LKL (outside) E9 knee lever lowers the 5th and 10th strings to Bb. The 6th LKL C6 knee lever raises the 3rd and 7th strings from C to C#. The pickups are original ZumSteel single coil, wound to about 18K ohms. $4000.00 plus shipping. PayPal (add 3%) or cashier’s check accepted. This 1980 Emmons guitar S/N 173 ST 10 has just been completely restored. It was quite a project to take on, as the original owner has done some extensive “modifications” to it, which needed to be repaired in order to return the guitar to looking as original as possible. 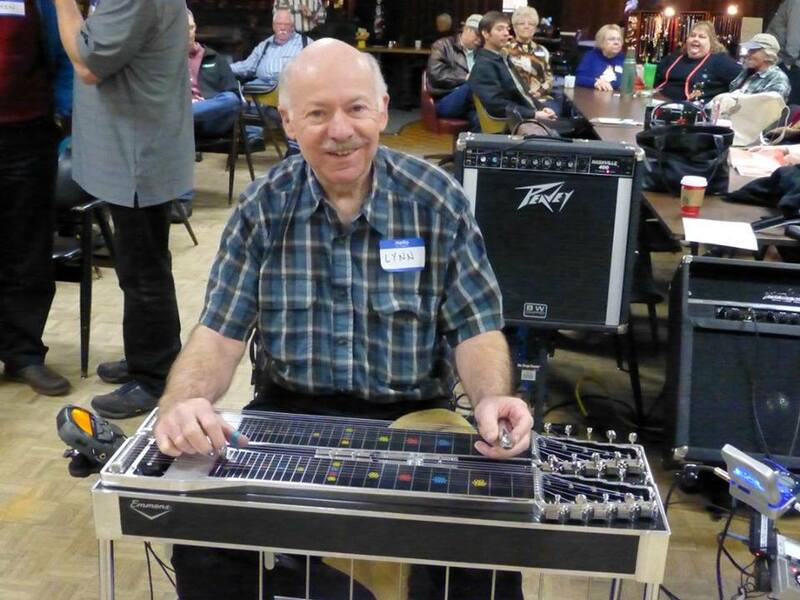 I recently posted a topic on the Steel Guitar Forum that describes more in detail what was done, so if you’d like to know more, please feel free to click on the link below, which will take you there. I completely dismantled the guitar, thoroughly cleaned and inspected everything and replaced any worn parts. The “loafer” pad on the rear deck, tone control assembly, A and B pedals, fret board, changer axle, etc. were replaced along with a few other parts. The case I have for this is in “like new” condition and covered with sharp-looking tweed vinyl (looks similar to what Fender used to use). The legs are standard height. It has that “famous Emmons sound” folks rave about, great sustain and of course it plays like a dream. I just finished doing the final the set-up, so it’s ready to gig right now! This guitar has a very standard Emmons set up; 3×4 with E’s on the left but I’ll be happy to switch it to Day style, (or your own copedent) at no extra charge (as long as no additional parts are required). The stock single coil pickup is wound to about 20K ohms. $3000.00 plus shipping. PayPal (add 3%) or cashier’s check accepted. This is one of the very last guitars that the late Jimmy Crawford and John Hughey produced and utilizes the latest changer design (featuring raise helper springs). The letters JCH stand for Jenkins (Conway Twitty’s real name was Harold Jenkins), Crawford and Hughey. The serial number is 2086. You’ll notice that there are quite a few polished parts in the under carriage, so I feel the original owner must have paid a premium for this upgrade. This is a very smooth playing all-pull guitar, very similar in looks to an early Emmons Lashley LeGrande with 4 hole rod pullers. It’s an original (except for the pickups) un restored guitar in very nice 9/10 condition. Excellent playability and awesome tone! This guitar has a very standard Emmons set up; 8×5 with E’s on the left but I’ll be happy to switch it to Day style, (or your own copedent) at no extra charge (as long as no additional parts are required). The Emmons single coil pickups are wound to about 18K ohms. $4300.00 plus shipping. PayPal (add 3%) or cashier’s check accepted. I completely restored this 1976 Emmons guitar S/N 2253D from top to bottom, it’s the real deal and correct as it can be, right down to the proper slotted wood screws holding the brackets to the cabinet. The highly figured birds eye maple cabinet was reflocked, aluminum professionally polished, necks jeweled, etc. and the fret boards are new Emmons Factory replacements. The original Kluson butterfly keys are in great condition. Original legs are standard height. The fatback guitars from this era are some of the best sounding ones and this is no exception! It has that huge Emmons push-pull tone, wonderful sustain and it plays like a dream. Here are a few photos that were taken in the direct sun, to try to show off the highly figured birdseye maple in the cabinet. The ones below were taken on my deck in the shade. Here is a photo of the “neat as a pin” under carriage. Knee levers are anodized black. At the moment, this guitar has a very standard Emmons set up; 8×4 with E’s on the left but I’ll be happy to switch it to Day style at no extra charge. I’ll also make changes to the existing copedent for free as long as you pay for any additional parts (if required). If you’d prefer to have more knee levers, I could certainly oblige by adding more of them (for an additional charge, of course). The original Emmons single coil pickups are wound to about 18K ohms and sound perfect to me. Included is a hard case in great condition and a new D2F leg bag. $4200.00 plus shipping. PayPal (add 3%) or cashier’s check accepted. Well, here’s my latest project that I just finished up. I’m pretty happy with the way it turned out and I hope you feel likewise! The cabinet was stripped and refinished by my friend, Bob Littleton in Camas, Washington. We tried to stay with the original teal color (without the black corner shading) that had really faded. Here is a link to his web site. I completely restored this Original push-pull Emmons guitar (serial number 1838D) from top to bottom. It’s the real deal and correct as it can be, right down to the proper slotted wood screws holding the brackets to the cabinet. The only change I made was eliminating the black corner shading on the lacquer finish. The cabinet was re flocked, all aluminum professionally polished, necks jeweled, etc. The fatback style guitars from this era are some of the best sounding ones and this is no exception! It’s “bulldozer” in the tone department and it plays like a dream. Here is a photo I took indoors to try to show a good representation of the shade of teal it has. To my eye (in person) it actually looks a little more green than blue. Here are some photos I took in the direct sun to try to show off the highly figured cabinet. In these, it looks more blue than green. Here is a photo of the under carriage. Note the polished knee levers! At the moment, this guitar has a very standard Emmons set up; 8×4 with E’s on the left but I’ll be happy to switch it to Day style at no extra charge. The original Emmons single coil pickups are wound to about 15K ohms. I completely restored this Original push-pull Emmons bolt-on changer style guitar (invoice number 2891) from top to bottom about a year ago. It’s correct as it can be, right down to the proper slotted wood screws holding the brackets to the cabinet. Because it lived most of its life in North Carolina, most of the nickel plating in the under carriage was lightly pitted, so I chose to have all the steel parts stripped and re nickel plated. The cabinet was re flocked, all aluminum professionally polished, necks jeweled, etc. The bolt-on style guitars from this era are some of the most desirable, because of their very distinctive tone! Bolt-on guitars were only built between 1964 and 1967, so relatively few exist, especially in this color, as most were black. This very unusual mica is actually off-white and has a leather-like texture to it. This guitar has a big, full sound and plays like a dream. This guitar has a very standard Emmons set up; 8×5 with E’s on the left but I’ll be happy to switch it to Day style at no extra charge. The original Emmons single coil pickups are wound to about 17K ohms. $5500.00 plus shipping. PayPal (add 3%) or cashier’s check accepted.